Relish the memory. 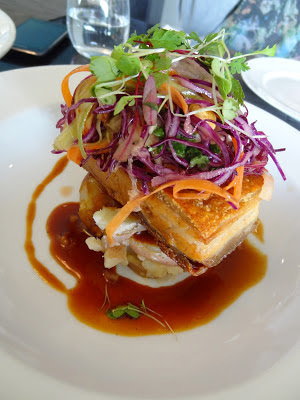 : Partial to Pork Belly. I have had this wee post planned for a while now and on the back of a fruitful, food-laden, Pork Belly included trip to Dunedin, it was time. Pork, get in my belly. Despite the influx of Mexican favourite Pulled Pork hitting the culinary world, least we forget this thick slab of gold. The infamous dish often epitomises fine-dining and can be found on the menu of most fancy eating establishments. It’s rich and indulgent, but pork belly perfection is not an easy task to master. For your viewing pleasure c/o Nova Cafe, Dunedin. Circa - May 2012. The strangest yet most exciting version I have experienced was from the depths of the south, a quirky ski town, bustling with tourists and laden with wealthy locals - Wanaka. 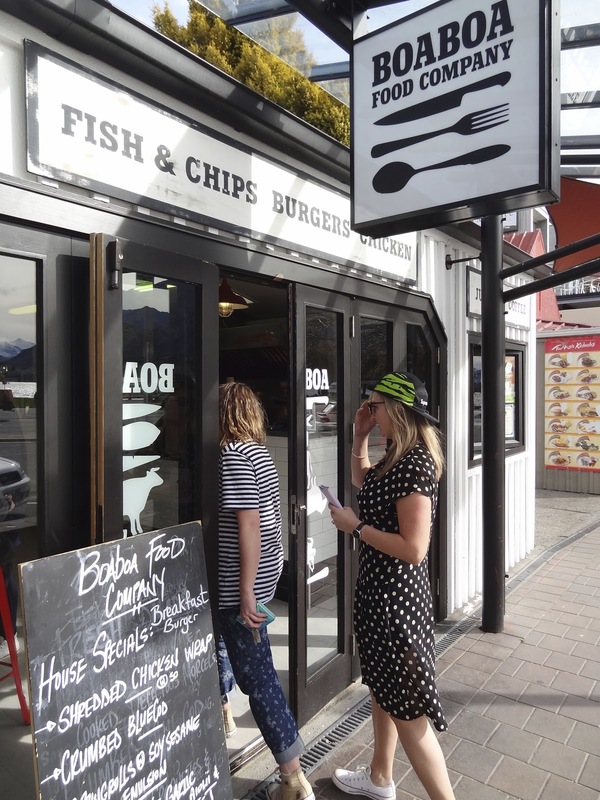 Boa-Boa Food Company is the latest and greatest addition to gourmet feasting in Wanaka. An upmarket takeaway designed to satisfy a hearty appetite to be enjoyed at home or by the lakeside. Owned by Leungo Lippe the uber talented Botswana-born Chef. After helping establish the highly acclaimed Botswana Butchery with restaurants in both Queenstown and Auckland - it seems whatever this man touches is guaranteed to taste good. Boa-Boa Food Company. Get here. It's Supreme. Add another two words to our old friend and you have yourself a mouthful from heaven. Pork Belly Spring Roll. A crisp golden cylinder, packed with delicate, juicy shards of pork immersed among shredded red cabbage, fresh mint, fragrant coriander and encased by a lightly fried (well deeply-fried) crunchy spring roll shell. I don’t think I even need to mention the sticky, sweet, umami soy-sesame emulsion that comes alongside to get you drooling. Incredible didn’t even cut it. With a Pork Belly Burger also on the menu made complete with jalapeno mayo I think its safe to say Boa Boa should be expecting to see my face again soon. An adventure with friends to find some sort of cheap and cheerful eatery in South Dunedin, led us to the fine-dining establishment at St Clair Beach; Pier 24. Without complaint and amongst frugal company, we were tactful with our choices and came away seriously satisfied with our $18 feast. Unanimous decisions were made and Pork Belly was selected. Despite eating one a mere 14 hours prior I was more than happy to oblige. This version had a strong Asian influence served on crushed new potatoes, a crunchy peanut slaw and finished with a sticky hoisin concoction. The picture says it all. A plate of perfection c/o Pier 24. The key to a good pork belly in my opinion is in the textural variation of each layer. Blistered, crunchy crackle – is a must. Chewy, rubbery skin just isn’t worth the mouth power. The final requirement is a higher meat to fat ratio. Obviously you need both but after all it is the protein you want to appreciate and not just a wad of fatty tissue. Get those things right and you have a hero. As we divided this piece into thirds, the bread knife managed to shred the delicately tender meat with ease. With that chewy char-grilled section on the bottom submerged in hoisin; my love for this juicy pig reached a whole new level. The final Pork Belly tail was a homemade version from my talented Barista of a friend. True to his ethnic roots – he is a right whizz in the kitchen. And his birthday celebrations consisted of some seriously succulent morsels. He kindly filled me in on his secret recipe of Chinese five-spice and salt and pepper. The Asian cuisine and pork belly are like Kiwi cuisine and hot chips. One is not complete without the other, so as imagined Mr Wong’s perfectly scorched, sizzled crackle, the slightest band of juicy fat atop the delicately moist meat were nothing far from exceptional. Just so you never forget. Note: I must mention my endeavour used Annabel Langbein’s technique where she cooks it in a milk and sage bath to ensure tenderness. I vouch for the method – but my other elements needed work. Hence lack of photo. Wish me luck.